Welcome to San Diego Chiropractic Center! Since 1990, Dr. Ronald Fritz, DC at San Diego Chiropractic Center has been providing a full range of chiropractic care. Studies have shown that spinal and musculoskeletal conditions such as back pain, neck pain, headaches, stiffness, extremity pain, sciatica and arm pain and tingling are effectively treated with a conservative chiropractic approach. The chiropractic approach is grounded in the spinal adjustment which is safe and effective. Dr. Fritz performs manual soft tissue therapy and manipulation prior to, and in conjunction with, the chiropractic adjustment which allows for a more gentle technique. Dr. Fritz's clinical experience includes successfully treating patients with personal injuries resulting from automobile and work-related accidents, sports injuries and wellness and family care. 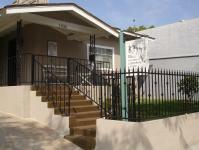 The office is centrally located in the quaint neighborhood of South Park, California. It can be found at the corner of Fern and Grape Streets, next door to The South Park Grill and around the corner from The Big Kitchen. Drive time is approximately 5 minutes to highways 94, 5 and 805. The office is one block from the city bus stop MTS Route #2.